The team did two bandings today. Pilsen was the first site for us. When we opened the door to the nest area, the female was in the box. She popped out and puffed up three times her size, trying to scare us off. It didn’t work, but I, for one, was impressed. 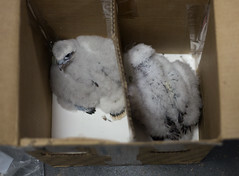 We banded three chicks — two males and one female. They were all healthy and squawky. I was able to identify both adults. One of my favorite males, an unnamed male who I call “Lynn”, still rules the roost at Pilsen. He’s a hometown boy from our North Broadway nest. He is 13-years old this year! The female was Bob, who was here last year as well. She’s changed her nest defense protocols. Last year, she was up in the air and swooping a lot. This year, she came a lot closer in, even landing to take us on from the ground a few times. Good to see that pair is still going strong! ~ by Steph on May 29, 2013.